As Long Islanders attempt to get back to business as usual, freezing rain and some unplowed roads lead to numerous school and business closures. The remnants of Winter Storm Nemo have been cleared away enough to finally open the Long Island Expressway in both directions, but commuters are not home free yet. The National Weather Service issued a freezing rain advisory from 5:16 a.m. to 9 a.m. that snarled traffic on roads that already need further cleanup. Though the advisory is no longer in effect, the combined rain and slush will still make for dangerous travel conditions. Though state and county roads are mostly plowed, many town roads remain unplowed. Due to the hazardous local driving conditions, most school districts on Long Island have closed for Monday. For any districts that used all of their “snow days” during Hurricane Sandy, when power outages left many in the dark for upwards of a week, today’s snow day will have to come out of another school vacation, such as spring break or Memorial Day weekend. The Long Island Rail Road continues to operate on near-normal weekday service for nine out of eleven branches, including City Zone and the Babylon, Port Washington, Port Jefferson, Far Rockaway, Long Beach, Hempstead, West Hempstead and Oyster Bay Branches. All service east of the Ronkonkoma on the Ronkonkoma branch and east of Speonk on the Montauk branch suspended until further notice. For east end train riders, the LIRR will provide bussing between Ronkonkoma to Greenport in both directions. Parking is currently an issue at most LIRR stations, as parking lots are not completely plowed, or have lost spots due to plowing. The LIRR is encouraging a “kiss and ride,” meaning that commuters are urged to have someone drop them off at the station to reduce parking troubles. As of Monday morning, approximately 135 homes were without power. Though LIPA and National Grid missed their deadline of restoring power to the entire island by Sunday night, they continue to work through the rain and slush to finish the job. 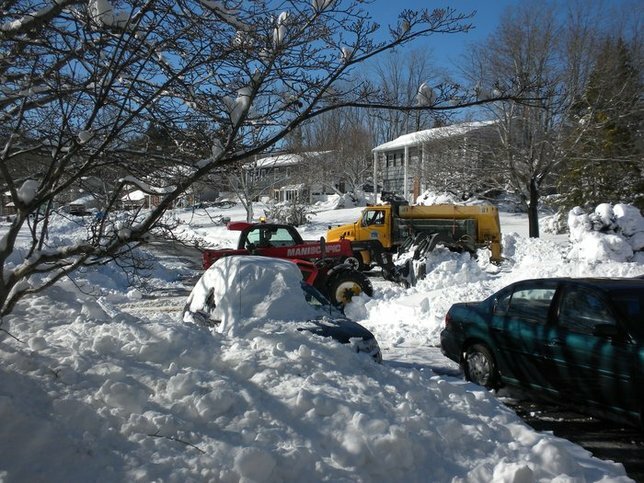 For more updates on how Long Island cleans up after Winter Storm Nemo, check LongIsland.com for further news. Subject: LongIsland.com - Your Name sent you Article details of "Monday's Nemo Update: LIE Open, Some Services Returned to LIRR, Schools Closed"